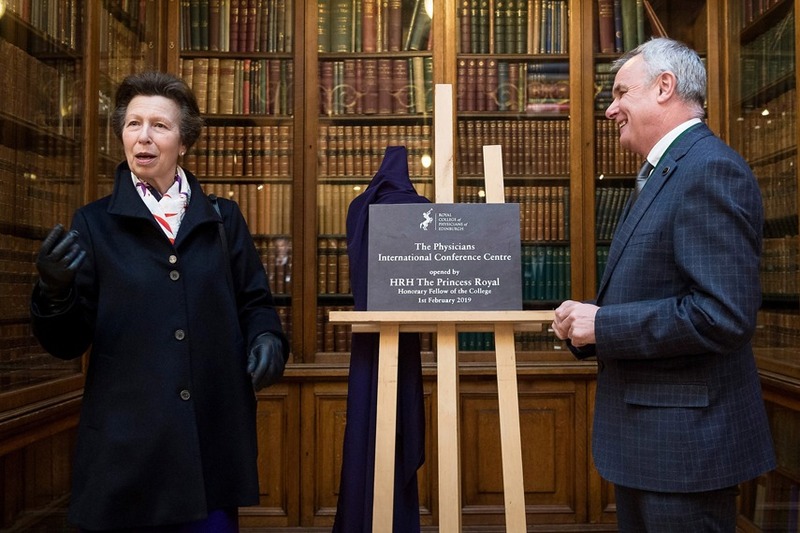 The redeveloped Physicians International Conference Centre at the Royal College of Physicians of Edinburgh was officially opened today by HRH The Princess Royal. Costing £3.5million, the redevelopment transforms the event experience for delegates and visitors, creating Edinburgh’s newest and one of its largest city centre conference venues. The Royal visit coincided with the College’s flagship Futuristic Medicine conference which was arranged to mark the official opening. As guest of honour, The Princess Royal toured the new facilities, chatting with those involved in the conference, and joined the almost 200 delegates in the new facilities. The Princess Royal is an Honorary Fellow of the College, and previously opened a refurbishment of part of the historic buildings in 1991. She is known to have a keen interest in issues relating to health, medicine and research. “It is an honour to welcome HRH The Princess Royal to our wonderful, refurbished conference centre. We are particularly proud of our new facility – refurbishing any building is a complex task, but more so when the buildings in question are nearly 300 years old. Located in Edinburgh’s New Town, The Physicians International Conference Centre at The Royal College boasts one of Edinburgh’s largest auditoriums and a range of modern and historic meeting rooms. The auditorium can host up to 300 delegates and is equipped with state of the art audio-visual and teleconference systems. One of the main drivers of the refurbishment was to make the Physicians International Conference Centre and the wider College more accessible. The venue now includes a newly redesigned and refurbished reception and foyer, a new public exhibition space, upgraded conferencing facilities, and a new, fully accessible entrance on Queen Street. The refurbishment also created a dedicated exhibition space where the College can display its historic collection of books and items.